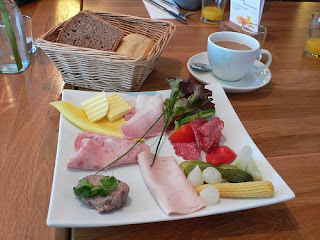 GridCast: live and behind the scenes of grid computing: A celebration of Frühstück – Guten Morgen from Berlin! A celebration of Frühstück – Guten Morgen from Berlin! 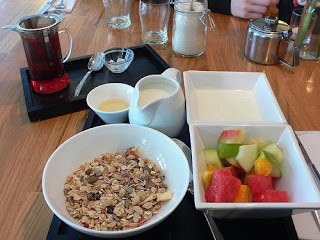 You'll forgive the diversion I hope, but I must turn my attention briefly to a subject dear to me – breakfast, and to celebrating the fact that Berlin does it brilliantly. I'm typing from the moment in the hotel's cafe, lingering over the last drops of my second cup of coffee. The hotel includes breakfast with your stay and it says something that the options come in not one, but three, offerings. This morning I opted for the 'healthy breakfast' (see above, seemed only right since I am attending a health conference afterall), yesterday however I feasted on the 'Berliner breakfast' (below) and may return again to it tomorrow. Living as I do, in a city that does not know what to do with the notion of a morning meal – like anyone, I'm all for a croissant, but a crumply confection of butter and flour is not really to be taken seriously – it's a delight to be in a place that takes the idea of breakfast and runs with it! I see signs outside restaurants that say Frühstück 7:00-14:00 – stretching the definition somewhat... but honestly, why hold a good thing back? Images kindly borrowed from heatheronhertravels under a CreativeCommons license.